Klaus returns for an epic oversized one-shot, perfect for any comic fan's stocking! 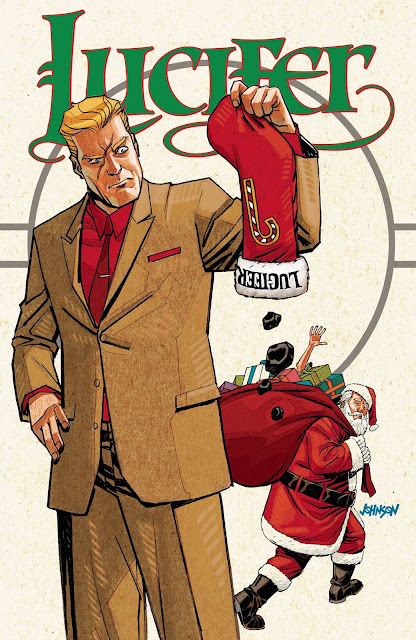 Brought to you by legendary creator Grant Morrison and 2016 Russ Manning Award winner Dan Mora, join the continuing adventures through space and time of the man that would become Santa Claus. Come spend the holidays with Harley in issue #10's collection of wintry short stories-just don't expect to make it to New Year's in one piece! It's a LUCIFER holiday special! Forget coal-this nice 'n' naughty issue is your reward for a year of indulgent misdeeds with the devil. Writers Holly Black and Richard Kadrey team up to deliver a darkly festive and irreverent ode to the joy of seasonal sin and twisted Secret Santas. When a school holiday pageant takes an extraterrestrial turn, Mulder must contend with old ghosts, present dangers, and close encounters yet to come. But this is no cookie-cutter Christmas Carol. Together with Scully, and a host of holiday visitors and visitations, they'll rediscover the spirit of the season... if they can only survive the night. Executive produced by The X-Files creator Chris Carter! YOU BETTER NOT POUT, YOU BETTER NOT CRY! 'Cause you're getting an extra helping of POWER MAN AND IRON FIST! This Christmas will be sweet, indeed! But not for Luke Cage, who is feeling neither holly nor jolly. Surely Danny can change that! Or maybe these demonic toys will! Wait, demonic toys?! OH, NO! Drink a glass of egg nog sitting by an open crackling fire while you appreciate the joy of reading a comic book during the Christmas holiday break. Is there a favorite comic book that you like to pull out to read this time of year?